Prince Amyn Aga Khan views rock crystal chess pieces and decorative bowls from the Fatimid period during a tour by curator Dr. Assadullah Souren Melikian-Chirvani. The World of the Fatimids exhibition featured 87 artefacts from over a dozen institutions and was held from March 10 – July 2, 2018. Photo: The Ismaili/Connie Tsang. The Exhibition offered museum visitors a glimpse of history, which was a first of its kind in North America. It pulled together various artefacts (about 90 in total) from 14 international lenders based in Paris, London, New York, Cairo and others. The exhibition took place during Aga Khan IV’s Diamond Jubilee year as the 49th hereditary Imam of the transnational Shi‘a Nizari Ismaili Muslim community. JUNE 26, 2018, LONDON, U.K. The Aga Khan Centre was opened by HRH the Prince of Wales in the presence of Mawlana Hazar Imam, at an inauguration ceremony to coincide with Hazar Imam’s Diamond Jubilee visit to the UK. Mawlana Hazar Imam was joined by Prince Amyn, Princess Zahra, Prince Rahim, Princess Salwa, Prince Hussain, and Prince Aly Muhammad, for a momentous occasion in the history of the Ismaili Imamat and the global Jamat. Mawlana Hazar Imam and Prince Amyn in conversation with Mayor of London Sadiq Khan, at the opening ceremony of the Aga Khan Centre in London. Photo: The Ismaili/Anya Campbell. Lord Ahmad of Wimbledon, Foreign Office Minister; and Sadiq Khan, Mayor of London, were also present at the opening ceremony of the Aga Khan Centre, situated at the heart of London’s thriving Knowledge Quarter, located in the revitalised area of King’s Cross. The building was designed by Maki and Associates – his third for Mawlana Hazar Imam following the Delegation of the Ismaili Imamat in Ottawa and the Aga Khan Museum in Toronto. Ireland’s President Michael Higgins and his wife Sabina receive Mawlana Hazar Imam at their official residence in Áras an Uachtaráin. Photo: Website, The President of Ireland/Maxwell Photography. His Excellency President Michael Higgins of Ireland and his wife Sabina Mary Coyne on August 11, 2018, received Mawlana Hazar Imam at their official residence Áras an Uachtaráin. The occasion honoured the Hazar Imam’s Diamond Jubilee which concluded in Lisbon on July 11, 2018. Mawlana Hazar Imam also attended the Nations’ Cup, the international show jumping competition which was established with help of Mawlana Sultan Mahomed Shah, His Highness the Aga Khan III in 1926. Ireland’s President Michael Higgins and his wife Sabina (in background) receive Mawlana Hazar Imam at their official residence in Áras an Uachtaráin. Photo: Website, The President of Ireland/Maxwell Photography. Mawlana Hazar Imam’s family engagement with Ireland’s equine industry and related economic development spans three generations. The two leaders expressed their commitment to working together to support sustainable development and the strengthening of civil society and of human resource capacity to improve the quality of life and create opportunity in various parts of the world. France’s Minister for Europe and Foreign Affairs, Jean-Yves Le Drian Minister Le Drian applauds as His Highness the Aga Khan expresses his appreciation to the French government after receiving the country’s highest national medal of honour. Photo: AKDN /Cécile Genest. President Emmanuel Macron awarded Mawlana Hazar Imam, His Highness the Aga Khan, the Grand Cross of the Legion of Honour – France’s highest national medal of honour in recognition of his contribution to humanity and achievements over the past 60 years in improving the quality of life of the most vulnerable populations around the world. The honour was bestowed by upon Mawlana Hazar Imam at a ceremony on September 19, 2018 at le Quai d’Orsay by France’s Minister for Europe and Foreign Affairs, Jean-Yves Le Drian. From L to R: Prince Rahim Aga Khan, son of His Highness the Aga Khan, Prince Amyn Aga Khan, brother of His Highness the Aga Khan, Xavier Darcos, Chancelier of the Institut de France and Former Government Minister, Hubert Védrine, Former Minister of Foreign Affairs, His Highness the Aga Khan, Jean-Yves Le Drian, Minister for Europe and Foreign Affairs, Princess Zahra Aga Khan, daughter of His Highness the Aga Khan, Laure Darcos, Senator from Essonne and Maria Vadillo, Spouse of the Minister for Europe and Foreign Affairs. Photo: AKDN/Cécile Genest. On 18 September, President Macron received Mawlana Hazar Imam at the Élysée Palace in Paris — the official office and residence of the President of France. President Emmanuel Macron and His Highness the Aga Khan in conversation upon arrival at the Élysée Palace. Photo: AKDN/Cécile Genest. OCTOBER 4, 2018, LONDON, U.K.
R to L: John McNee, Secretary General of the Global Centre for Pluralism; Mawlana Hazar Imam; The Right Honourable Adrienne Clarkson, former Governor General of Canada; The Right Honourable Earl Howe, Deputy Leader of the House of Lords; Princess Zahra. Photo: The Ismaili/Nayyir Damani. Karen Armstrong, the British author, delivered the annual 2018 Global Centre for Pluralism Lecture on October 4, 2018 at the new Aga Khan Centre in the presence of Mawlana Hazar Imam, Princess Zahra, former Governor General of Canada Adrienne Clarkson, and Secretary General of the Global Centre for Pluralism John McNee. The title of Ms. Armstrong’s lecture was “Compassion or Toleration? Two Approaches to Pluralism”. Each person invited to give the Annual Pluralism Lecture is asked to reflect on how to build and strengthen pluralist societies. The Lecture is hosted by the Global Centre for Pluralism, an independent, charitable organization founded by Mawlana Hazar Imam in partnership with the Government of Canada. It is based in Ottawa, Canada. This was the first time that Annual Pluralism Lecture was held outside of Canada. Citing her current work on the scriptures of three of the world’s great religions, she went on to say that “the scriptures — all, in every tradition — say you have to work for the good of others, all others, not just those in your own camp, practically and creatively. That is the route to enlightenment.” Following the lecture, BBC’s Lyse Doucet moderated a conversation with Armstrong, giving the audience an opportunity to ask questions. Following the 2018 Annaul Pluralism Lecture, The Right Honourable Adrienne Clarkson (right) extends thanks to Karen Armstrong on behalf of the board of the Global Centre for Pluralism. Photo: The Ismaili/Global Centre for Pluralism/Anya Campbell. Prior to introducing Karen Armstrong, Mawlana Hazar Imam spoke about the late Kofi Annan. The former United Nations Secretary-General and Nobel Peace laureate, delivered the Annual Pluralism Lecture in 2013 and also sat on the Global Centre’s Board. “I was privileged to know and work with Mr Annan for many years. He made an enormous contribution to the Global Centre for Pluralism, just one of his many remarkable contributions to humanity. He will be greatly missed,” Hazar Imam said. From left: University of Alberta President David Turpin, Premier of Alberta Rachel Notley, Lieutenant Governor of Alberta Lois Mitchell, and Mawlana Hazar Imam unveil the plaque inaugurating the Aga Khan Garden, Alberta. Photo: The Ismaili. Mawlana Hazar Imam arrived in Edmonton on October 15, 2018, accompanied by Prince Aly Muhammad, to begin a visit to Canada that included the inauguration ceremony of the Aga Khan Garden in Edmonton as well as degree conferral ceremonies in Calgary and Vancouver. Mawlana Hazar Imam joined Lieutenant Governor of Alberta Lois Mitchell, Premier of Alberta Rachel Notley, and University of Alberta President David Turpin on 16 October for the inauguration of the Aga Khan Garden, Alberta. The 4.8-hectare Aga Khan Garden, Alberta, located 15 minutes southwest of Edmonton, is the northernmost Islamic garden in the world. Inspired by Mughal-style landscape architecture, it features limestone terraces, geometric water features, an outdoor amphitheater, and an orchard of local plants selected for fragrance, beauty, and ability to thrive in Alberta’s climate. The Aga Khan Garden is Mawlana Hazar Imam’s second landscape project in North America along with the Aga Khan Park in Toronto, and the 11th in a series of parks and gardens developed by the Aga Khan Thrust for Culture. The addition of the Aga Khan Garden to the University of Alberta Botanic Garden is expected to more than double the number of annual visitors from 75,000 to 160,000. Mawlana Hazar Imam poses for a photo following a ceremony where he was conferred with an honorary Doctor of Laws degree by the University of Calgary in recognition of his “impact and spirit,” which Chancellor Deborah Yedlin noted “have been felt by millions of people.” Photo: The Ismaili/Asif Bhalesha. The University of Calgary conferred Mawlana Hazar Imam with its highest academic honour: a Doctor of Laws, honoris causa, reserved for the most distinguished individuals who have made extraordinary achievements in community, national, or international services. Mawlana Hazar Imam looks on as University of Calgary President Dr Elizabeth Cannon reads aloud the citation accompanying the honorary Doctor of Laws degree conferred upon him in a special ceremony at the University’s Rozsa Centre. The citation highlighted Hazar Imam’s outstanding contributions to humanity and expressed admiration for his ability to bring together faith and action. Photo: The Ismaili/Asif Bhalesha. The University of Calgary confers an honorary degree, Doctor of Laws, honoris causa, to His Highness the Aga Khan, during a special ceremony on Wednesday, October 17, 2018. Photos: The University of Calgary. Father and son — Mawlana Hazar Imam and Prince Aly Muhammad — pose for a photo after the University of Calgary conferral ceremony. Photo: The Ismaili/Asif Bhalesha. Professor Santa Ono, President and Vice-Chancellor of the University of British Columbia delivers part of the citation in honour of His Highness the Aga Khan, as Professor Andrew Petter, President and Vice-Chancellor of Simon Fraser University looks on. The two universities each conferred an Honorary Doctor of Laws on His Highness the Aga Khan in an unprecedented joint ceremony. Photo: AKDN/Asif Bhalesha. The University of British Columbia and Simon Fraser University each awarded an honorary doctorate of laws degree to His Highness the Aga Khan in a joint conferral ceremony—a first for both universities. The honorary degrees, which were conferred together at a ceremony in Vancouver on October 19, 2018, were awarded in recognition of the Aga Khan’s lifelong service to humanity, and the intersections of his work at UBC and SFU. Prince Rahim and Princess Salwa Aga Khan with students at the Aga Khan Higher Secondary School Gahkuch located in Punial Valley, Ghizer District in Gilgit-Baltistan. The school is operated by the Aga Khan Education Services. Photo: AKDN/Adam Tait. Prince Rahim and Princess Salwa Aga Khan travelled to Pakistan for a six-day working visit in October 2018, which included stops in several districts of Gilgit-Baltistan as well as in Chitral district of Khyber-Pakhtunkhwa, along with the capital city of Islamabad and the southern city of Karachi. Prince Rahim and Princess Salwa Aga Khan with students and teachers at the Diamond Jubilee School in the village of Darkut, Silgan Valley, Ghizer District, in Gilgit-Baltistan. The school is operated by the Aga Khan Education Services. Photo: AKDN/Adam Tait. Prince Rahim and Princess Salwa Aga Khan visit transitional shelters being constructed by the Aga Khan Agency for Habitat (AKAH) in the aftermath of heavy flooding which submerged farmland and destroyed houses in the villages of Badswat and Bilhanz, located in Immit, Ishkoman Valley, Ghizer District in Gilgit-Baltistan. In July 2018, unusually warm weather precipitated intensified melting of snow and glaciers which resulted in a large glacial lake outburst flood. Photo: AKDN/Adam Tait. During their visit, Prince Rahim and Princess Salwa examined approaches to poverty alleviation and development, and visited a number of AKDN institutions and projects aimed at improving quality of life. 2018 Hadrian Award recipients, Dr. Eusebio Leal Spengler (left) and Prince Amyn Aga Khan are honoured at the 31st annual Hadrian Gala in New York, USA. Photo: AKDN/Akbar Hakim. Two extraordinary leaders in heritage conservation, Prince Amyn Aga Khan and Dr. Eusebio Leal Spengler, were presented with the 2018 Hadrian Awards at the World Monuments Fund’s 31st annual Hadrian Gala held at the Rockefeller Center Plaza in New York City, on Tuesday, October 23, 2018. Each year, the World Monuments Fund’s Hadrian Gala honours Champions of Conservation for their passionate commitment and extraordinary contributions to preserving and protecting the world’s shared cultural heritage. Among the past recipients of the Hadrian Award is Prince Amyn’s brother, Mawlana Hazar Imam, His Highness the Aga Khan, who accepted the award on October 25, 1996. Flashback. Left: Mawlana Hazar Imam being presented with the World Monuments Fund’s prestigious Hadrian Award by David Rockefeller on Octover 26, 1996. Mr. Rockefller was a recipient of the Award in 1994. Right: Mawlana Hazar Imam with younger brother, Prince Amyn, at the Hadrian Award Ceremony in 1996. Photos: Simerg Archives. “Prince Amyn and Dr. Leal represent the impact that steadfast leadership can have on cultural heritage sites and their communities around the world,” said Lisa Ackerman, Interim Chief Executive Officer, World Monuments Fund (WMF). “We are thrilled to honour their extraordinary accomplishments this year.” Prince Amyn holds multiple leadership roles within the Aga Khan Development Network (AKDN) and has been a lifelong supporter of cultural heritage in all its forms (please watch video, below). Dr. Eusebio Leal Spengler received the Hadrian Award in recognition of his unmatched contributions to the preservation of the historic center of Havana, which is inscribed on the World Heritage List. Mawlana Hazar Imam and the world leaders gathered for the opening session of the inaugural Paris Peace Forum all look to the sky as an aerial photograph is taken to mark this historic event. Photo: AKDN/Cécile Genest. Mawlana Hazar Imam on November 11, 2018, joined over 60 world leaders for the opening session of the inaugural Paris Peace Forum. Initiated by French President Emmanuel Macron, the Forum is founded on the principle that international cooperation is key to tackling global challenges and ensuring durable peace. The Forum was launched on the 100th anniversary of the Armistice, marking the end of World War I.
France’s President Emmanuel Macron delivers his introductory remarks at the inaugural Paris Peace Forum as Mawlana Hazar Imam and over 60 world leaders are gathered for the opening session. Photo: AKDN/Cécile Genest. Mawlana Hazar Imam was among over 60 world leaders for the opening session of the inaugural Paris Peace Forum. Here he greets President de Sousa of Portugal and Prime Minister Justin Trudeau of Canada. Photo: AKDN/Cécile Genest. 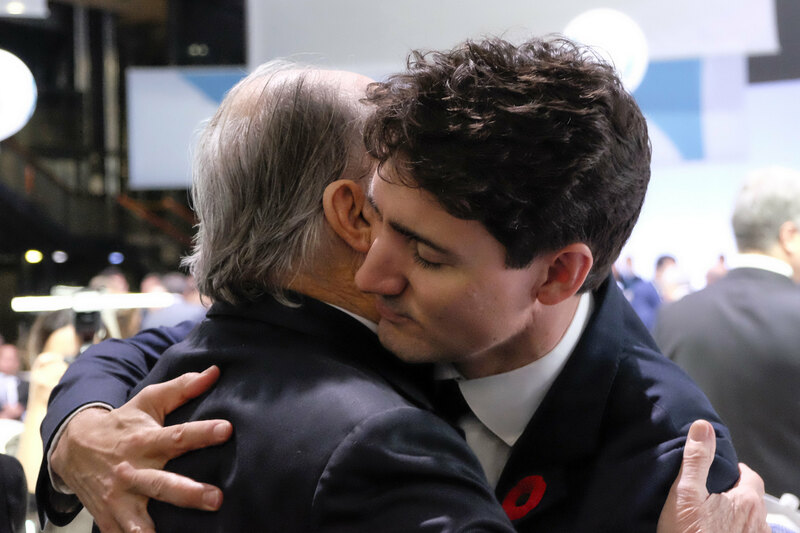 Mawlana Hazar Imam and Canada’s Prime Minister Trudeau in a warm embrace at the Paris Peace Forum. Please click on photo for different format sizes on flicker (upto 2048 x 1365). Photo Paris Peace Forum/ © Marion Dubier Clarck. Earlier in the day, Mawlana Hazar Imam was the guest of the French President at a lunch held at the Elysee Palace for all the visiting heads of state and government. Henry Kim, Director and CEO of the Aga Khan Museum, and Prince Amyn applaud after unveiling the donor wall at the Aga Khan Museum. Photo: The Ismaili/Aly Manji. The large donor wall at the Aga Khan Museum is installed by the auditorium entrance, parallel to the courtyard glass wall. The wall was designed to uphold and complement the elegant and timeless architecture of the Museum itself. The wall currently consists of 142 recognitions and will undergo ongoing updates to recognise continuing donor support. Photo: Aga Khn Museum Facebook page. Mawlana Hazar Imam in discussion with Afghanistan’s President His Excellency Mohammad Ashraf Ghani at a bilateral meeting held at the Geneva Conference on Afghanistan. Photo: AKDN/Jean_Luc Ray. At the Geneva Conference on Afghanistan on November 26, 2018, Mawlana Hazar Imam reaffirmed his commitment to Afghanistan and its people, underlining the importance of regional cooperation and a commitment to pluralism as key factors in the country’s development and stability. Date posted: January 29, 2019. Before departing this website, may we suggest that you visit Barakah’s Table of Contents for links to more than 100 pieces dedicated to Mawlana Hazar Imam and his family. Special acknowledgement: University of Calgary for their permission to reproduce photos from Utoday. The photos are displayed in an image as a collage, above. Enjoyed seeing and reading the missed events. You are are really gifted. May Mawlana Hazar Imam always shower his blessings and keep you under his care and protection. Thanks for sharing this wonderful article covering the 2018 events that you missed. Keep it up. Tons of Barakat to his excellency Malik sahib…such a phenomenal collection! Dr. Karim: You truly inspire me with your prayers, kind thoughts and an immense amount of respect. May you have success in all walks of life. Ya Ali Madad, Malik.